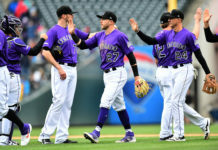 Despite the second-best record in franchise history (91-72), the Colorado Rockies were eliminated in the National League Division Series, and have multiple areas to improve before next year’s Opening Day if they intend to go even farther in 2019. 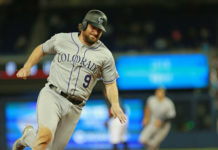 With free agency set to dispatch both a top-five hitter in the Rockies’ lineup (D.J. LeMahieu) and a top-five pitcher on the Rockies’ staff (Adam Ottavino) by Wins Above Replacement, the team will take a hit in the offseason. Outside of signing and trade possibilities, the Rockies have a core, all of which can improve in one area or another. With these improvements, the team can bypass their win total in 2018, and get one step closer to the World Series. A mainstay in the heart of the Rockies’ lineup, Nolan Arenado regressed last year at the plate. His .297/.374/.561 slash line, though topping most of the National League, left something to be desired. Despite his career-best 133 wRC+, Arenado only hit .184/.259/.327 in the ninth inning. In innings 7-9, Arenado hit a paltry .254/.347/.456, well below his overall numbers. In several games last year, the Rockies were in need of late-game production, something they failed to receive from Arenado. The problems have become commonplace for the third baseman. Though Arenado has tallied better lines in each category in the ninth inning in his career, even his career numbers leave something to be desired. Overall, Arenado has boasted a mere .208/.280/.371 line in the ninth inning. Not only has his power been sapped late in most games, but so too has his ability to put a charge into the ball. His slugging percentage in the final inning is a nearly 200 points lower than his career rate. The lowering of Arenado’s on-base percentage late in games has been mainly due to his inability to avoid strikeouts. In his career, the MVP runner-up has struck out in 22.3 percent of his at-bats. That number is over five-percent higher than his career total (17). If Arenado can correct his late-game woes, most notably his strikeouts, the Rockies’ offense serves to fare even better than their 26-15 record in one-run games last year — ad Arenado may very well win the MVP. After two years of being an all-or-nothing hitter, Trevor Story enjoyed a third-year resurgence last season. During his 2018 season, Story slashed .291/.348/.567 en route to an eighth-place finish in the National League Most Valuable Player race. Those three totals were all higher or tied with each of the two seasons prior for the shortstop. Despite getting on base at a career-high clip, the road had bumps for Story. In the season’s first two-and-a-half months, he hit to the tune of a mere .226/.320/.453 in April and March, with May being a subtle improvement at .257/.333/.515. Though the power was there, the consistency was not. That consistency, a trait that has evaded Story through much of his young career, is the road to the next level. Avoiding slumps such as the ones he was mired in across over a two-month span is the key. Striking out 55 times while walking just 24 times is how those slumps come to be. Never thought of as an on-base machine, Story did improve his pitch selection as the year progressed. The middle infielder finished with his lowest strikeout percentage of his career for the Rockies (25.6) and increased his contact percentage to a career-high as well (77.3). Those factors allowed Story to take the leap forward, swinging the bat to a plus-300 average for two of the next four months, with the others being over .288 each. Allowing himself to put the ball in play will pay dividends, and keep slumps at bay. In July, his best month last season, Story struck out only 20 times, accruing a batting average on balls in play of .439, also a season-high for a given month. Perched atop the Rockies’ lineup, Story led the offense to their best month in OPS (.830). If he is able to avoid the tendencies to swing out of the zone and miss the chance to put the ball in play, not only will Story improve even further, but the Rockies’ batting order will too. Dubbed “Chuck Nazty” after his late-career resurgence with the Rockies, Charlie Blackmon has been a linchpin for the teams’ pair of consecutive playoff appearances. It’s not all sunshine for the Rockies’ center fielder, though. As an outfielder, Blackmon posted the worst defensive wins above replacement of his career (-2.7). Furthermore, the -18 runs that Blackmon contributed on defense was the second-worst total in the NL behind only Bryce Harper (-22). The difference between the two is that Harper contributed 4.2 WAR on offense, compared to Blackmon’s 3.9. It has been clear for much of his career that Blackmon was not going to set the world on fire defensively. Without a single year in his career with even a full point of WAR defensively, Blackmon struggles. Those struggles, given Blackmon’s prominence as the lead outfielder, led the Rockies to be well-below average in runs saved defensively. 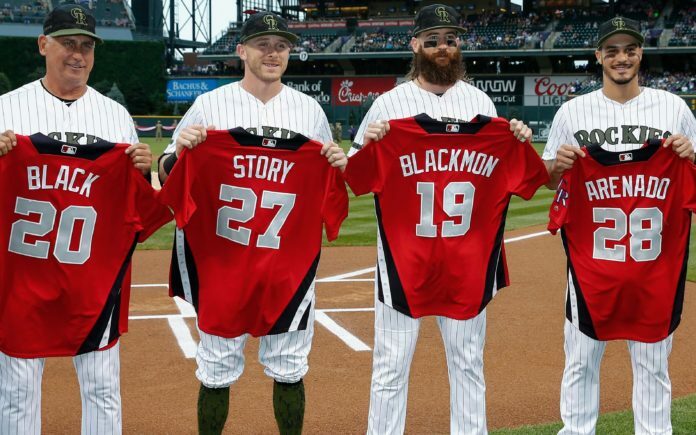 With an infield that has been chock full of Gold Glove talent, a move to a different position in the outfield or vast improvement is needed for Blackmon to match them. German Marquez was dominant for much of the second half last year. Registering a sub-2.50 ERA for the teams’ final two months allowed Marquez to finish the year with a career-low 3.77 ERA for the years’ totality. Marquez’ abilities could be heightened even further with a switch in his repertoire. Last season, Marquez threw his changeup a mere 6.4 percent of the time, his lowest percentage of any of his four major pitches. Seeking to keep hitters off balance given his 95.2 miles per hour fastball, Marquez has utilized the pitch sparingly. But, Marquez has chosen to utilize his breaking pitches (slider and curveball) a combined 38.5 percent of the time. Comparing that to one of the league’s best in Clayton Kershaw, Marquez falls short by a large margin to the southpaw’s 58.7-percent usage. The lack of usage is holding Marquez back to a degree, as the two breaking balls have registered by far the most value of any of his four pitches. His slider, valued sixth in the NL last season according to FanGraphs (11.2), has rivaled the effectiveness of even Max Scherzer (10.7). If the Rockies are able to allow the righty to use his breaking pitches more often, perhaps even ditching the changeup entirely, Marquez could take yet another leap. Coming to the Rockies as a hometown prospect, Kyle Freeland has been exposed to the nature of pitching at altitude for the majority of his baseball career. That past, along with proper coaching to the elements, has allowed the teams’ leading left-hander to register high ground ball rates for much of his career. Peaking in 2017 with his mark of a 53.9-percent groundball rate, Freeland knows how to keep the ball down. Last season though, despite his career year, Freeland regressed in his enforcement of grounders. His career-low 46.0 percent led to a career-high in flyballs at 34.5 percent. The reversal didn’t hurt him last season, but his fate could change quickly. As a team, the Rockies allowed 9.3 percent of their flyballs to leave the yard. That stat, when compared to Freeland’s 8.5-percent clip, signals some room for regression. If his mark begins to creep towards the teams’ average, Freeland’s career-best 2.85 ERA will rise with it. In 2017, among starters, Freeland tallied one of the best groundball rates in the league. Perched just behind Clayton Richard, the southpaw sat fourth in the league in groundball percentage. That mark, if repeated, will likely bring him higher than his fourth-place finish for NL Cy Young this year. As a cornerstone of the Rockies’ rotation for years to come, that would be a boon for the team’s success.